The Government today announced that Australia will adopt a new effigy of Her Majesty Queen Elizabeth II on all circulating and collector coins. 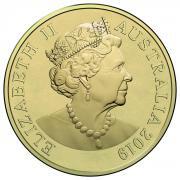 The new effigy of The Queen will be only the sixth to feature on Australia’s coins since Her Majesty’s accession to the throne in 1952. The effigy was designed by Jody Clark, an engraver for the United Kingdom’s Royal Mint. Jody Clark’s original effigy was chosen through a competition commissioned by the United Kingdom’s Royal Mint Advisory Committee and has been in use in the United Kingdom since 2015. The effigy to feature on Australian coins is an adaptation of Jody Clark’s original drawings. Her Majesty is portrayed wearing the Royal Diamond Diadem, which was worn for The Coronation. In keeping with tradition, Her Majesty continues to face to the right of the coin. Australians can expect to start seeing the new effigy on 2019-dated coins. It may take some time before these coins appear in people's change as the new coins will be distributed through banks across Australia as a first priority. Coins bearing previous effigies of Her Majesty will not be removed from circulation and will continue to be legal tender.